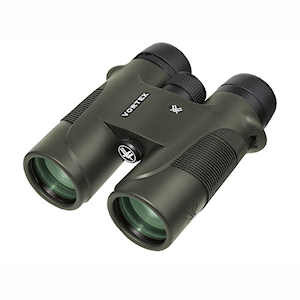 The Vortex Diamondback 8x42 binoculars offer quality optics at a budget friendly price in a lightweight package. Utilizing phase-corrected BaK-4 prisms, and fully multi-coated lenses, you can observe bright, crisp details in the world around you. The textured grip, focus wheel, and diopter offer you a good sense of control through tried and true ergonomics, while the twist out eyecups and 16mm eye relief offer comfort. The close focus measures at just 5', while an amazing FOV of 393' @ 1000yds offers a great span of viewing near and far subjects. All of that along with Vortex's VIP (no-fault) warranty means your Diamondback is always protected. Dimensions: 5.8 x 5.1 in. Product Weight (oz): 21.8 oz. 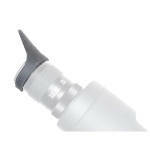 Generous Eye-Relief at 18mm for eyeglass wearers so you never have to struggle to see your target through the lenses. A reliable rubber armored housing with a nicely textured grip helping to prevent damage from minor impacts. Argon purged to prevent fogging. In Depth Features: First and foremost, Vortex offers undeniably good customer service with their 'VIP Warranty' which stands for 'Very Important Promise' and is their guarantee of satisfaction. The VIP Warranty is a lifetime, NO-FAULT Warranty that does not require any forms to fill out or receipts - in the event your Vortex product becomes damaged or defective — they will repair it at no charge to you. If it cannot be repaired, they will replace it with a product in perfect working order of equal or better physical condition. 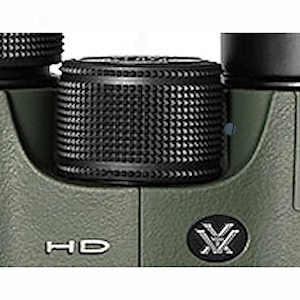 The VIP Warranty extends for all Vortex Optics binoculars, spotting scopes, rangefinders, riflescopes, prism scopes, red dots, tripods, and monoculars. Multi-Layer Lens Coatings: This means that the lenses have received multiple layers of anti-reflective coatings on all air-to-glass surfaces which increase light transmission to produce a brighter image and therefore better low light performance. 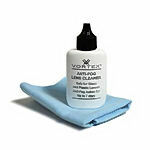 Anti-reflective coatings can make a really big difference on the brightness of the image produced. 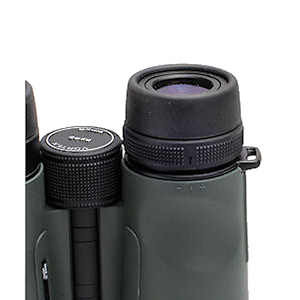 It is not unusual to look through binoculars with smaller objective lenses, but with higher quality anti-reflection coatings and seen them outperform binoculars with much larger objective lenses, but with fewer or no coatings. The diagram above shows how these coatings improve the transmission of light. Phase Correction: When light enters a roof prism, the beam is split into two paths and the resultant beams are circularly polarized. The two paths have slightly different lengths, so the polarization axes are not in phase when the beams recombine. Phase correction coatings are applied to the shorter path to equalize the path lengths so that when the beams recombine the polarization axes are in phase. This produces a brighter and sharper image. The top half of this image shows the benefits of phase correction. 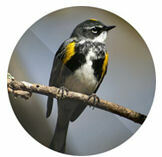 BaK-4 Prisms: First - Prisms are what let you see a correctly oriented image when you look through a pair of binoculars. 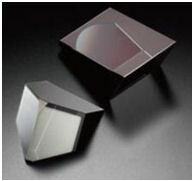 There are two types of prisms in common use, Porro prisms and Roof prisms. 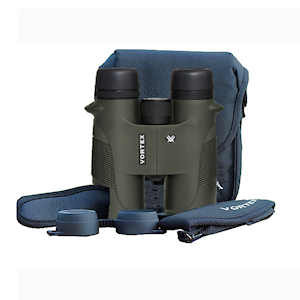 Roof Prisms as with the Vortex Diamondback binoculars use BaK-4 prisms are the best in less expensive binoculars; they are made of superior optical glass that produces clearer images. These are what you want in your binoculars. 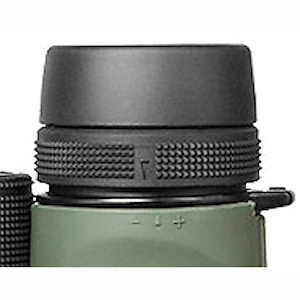 BK-7 prisms are used in lower priced binoculars. These are satisfactory, but they are inferior to the BaK-4 prisms. Some manufacturers will not tell you what kind of prisms they use, usually because they are of inferior quality.